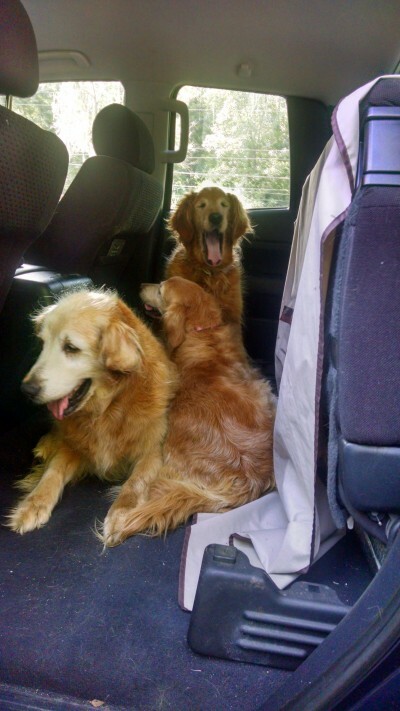 A few days ago ECGRR received word of 4 goldens at a county animal control facility. A breeder had gone out of business and had turned them over to the county. Within a few hours, our great group of volunteers organized a plan to rescue the 4 … arranging short notice transportation, vet care and foster homes. A few snags did come up. There were actually five dogs and one was an eleven year old “tri-pod” (missing a leg). The 3 males and 2 females were terrified when ECGRR arrived to get them and it was a bit of a struggle to get them into the transport vehicles. They were so scared that some buried their heads into the laps of the volunteers that were restraining them in the vehicles. Everyone seemed to calm down after about 20 minutes and in typical golden fashion, started enjoying the ride. After an initial medical evaluation and VERY MUCH NEEDED baths, the five were on their way to foster homes. Tsali (the tripod male) on left, Buffy is on the right, and Biscuit in the rear with the big yawn. Tsali – a 10 year old tripod male. The sire of the pack. Biscuit – a 7 year old male, the most out going of the two younger males. Pooh Bear – a 7 year old male. Buffy – a 7 year old female. After medical issues are addressed and we have an idea of any possible behavioral issues, we’ll have these “kids” ready for adoption to some loving forever homes!! Hats off and a giant thank you to the folks that made this all possible ….